Making sure your child is properly buckled in their car seat is just as important as buying a good car seat. You could have the world’s best car seat but if your child isn’t buckled properly then it’s just not going to help them stay safe. Once upon a time I was just like everyone else; I figured that as long as I snapped together that 5-point harness then my baby was safe and secure. It seems logical to think that buckling a car seat should be just as simple as buckling an adult seat belt; snap in and go. However, there’s more to it with car seats. Car seats are particular about how they are buckled. 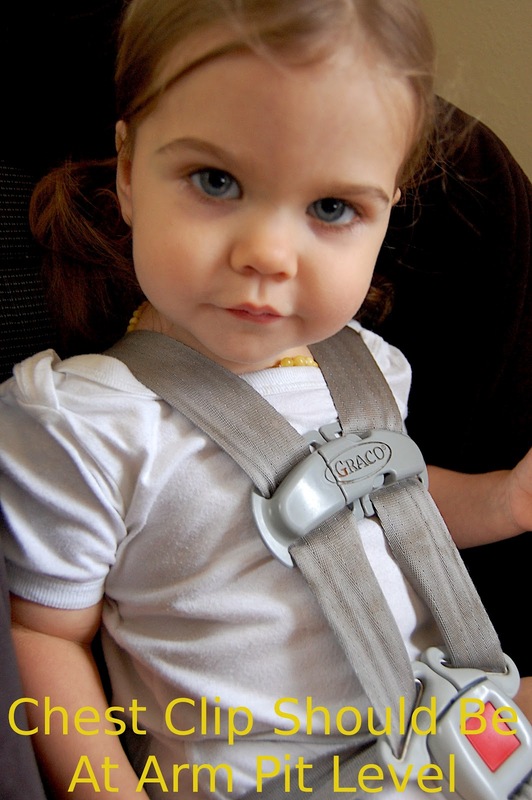 Did you know that depending on if your child is rear facing or forward facing, the harness needs to be in certain slots? Harnesses work differently depending on the way that the seat is facing. If you thread those straps the wrong way then they will not help in an accident. Shoulder straps need to be at or ABOVE the shoulders. It’s easy to install a car seat improperly. In fact 3 out of 4 car seats are installed improperly! Make sure you only use the LATCH system when it should be used and where it should be used (this is different for every vehicle and varies depending on seat location and even the weight of your child). Use that top tether! If your child is forward facing then you must use that top tether. If your child is rear facing then use the top tether only if your car seat manual says to (not all car seats are designed for rear facing top tethers yet). One of the most important clues to knowing if your car seat is installed properly is the wiggle test. If you can move the car seat around more than an inch side to side, then it is not tight enough. Generally when installing a car seat, you will need to actually press your knees into the seat so that it presses deep enough into your car in order to get a tight enough fit. It will be hard work but it’s worth it! Alternatively, you can take your car seat (with your car) to a Child Passenger Safety Technician and have them check it out or install it for you; usually this is a free service. It might seem that if a product is on the shelves then it must be safe to use. Unfortunately this is not true. 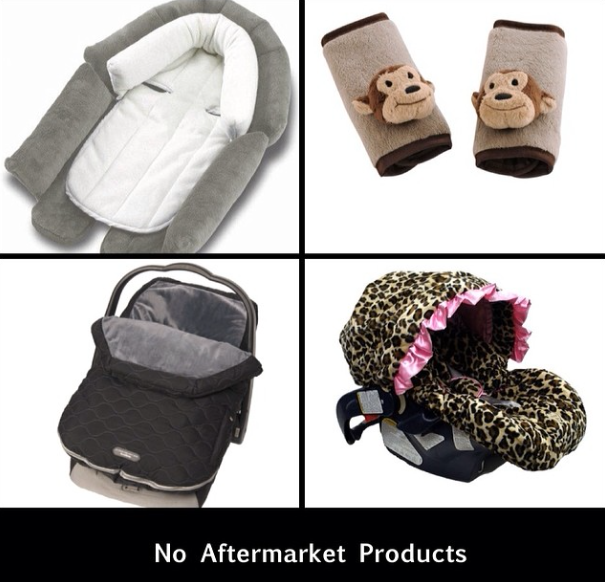 When it comes to car seats, you should not use ANY aftermarket products. This includes head cushions, buckle covers, car seat covers like the Bundle Me, and even those cute slipcovers that you can buy so that you can update the look of your car seat. It may not seem like it but aftermarket products can hinder the car seat’s ability to keep your child safe in an accident. Not to mention that it will void any warranties with the car seat manufacturer. If the product did not come with the car seat or can be purchased through the same car seat manufacturer for that specific seat then do not use it! This is a big one. The harness need to be tight! Harnesses need to lie in a straight line without any slack. There is a simple test that you can do to see if you have those straps tight enough; it’s called the pinch test. Buckle your child in their seat and then using your pointer finger and thumb try to pinch the strap near your child’s collarbone. If you can pinch the strap then that harness is not tight enough. If the harness is tight enough, you should not be able to pinch the strap. Sure it might be below freezing and you just want to keep your baby all bundled and warm but that jacket must come off before you buckle them in! Why? 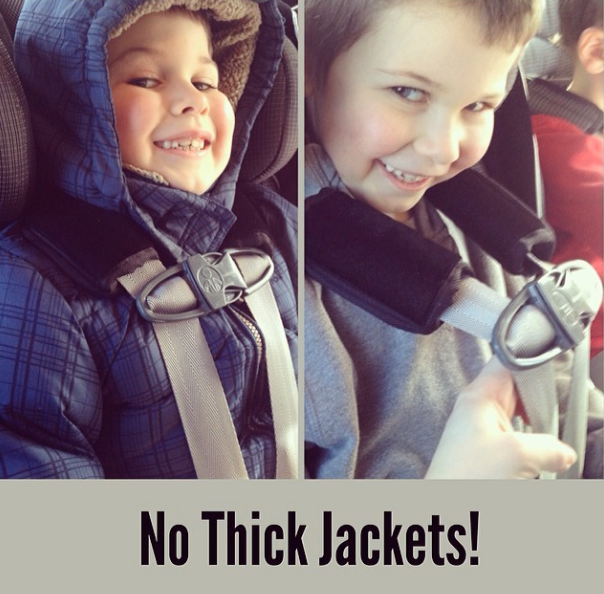 Because when you add a bulky layer like a jacket to the car seat mix, it makes the harness too loose. They may seem like they are snug but in an accident the jacket will compress and suddenly those straps that seemed so tight are now inches too loose! Don’t believe me? Try it! 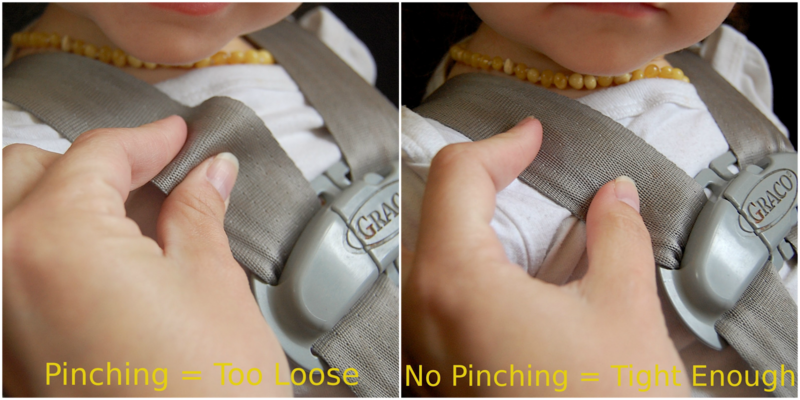 Buckle your child with a jacket on and get those straps as snug as you normally would. Now without loosening those straps, un-clip the buckles, remove the jacket, re-buckle and now see how snug that harness fits! Tons of slack! The safe alternative is to either have a car blanket that the kids can use or buckle your child into their car seat without the jacket and then place the jacket on backwards on top of the straps. Make sure you are using the right type of car seat for your child’s age, weight, and maturity level! In general, kids should be rear facing until they reach their car seats weight/height limit and are at least 1 years old although the recommendation is now 2 years old. You can read more about extended rear facing here. 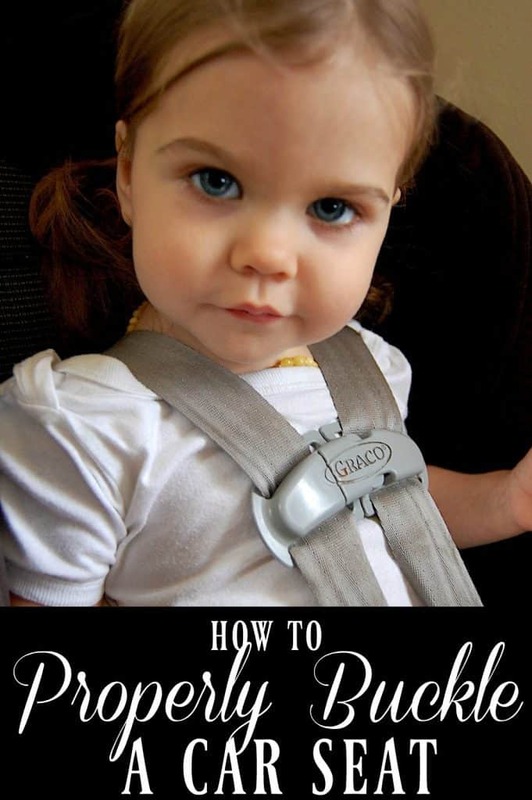 Kids should forward face until they meet the car seats weight/height limit or are at least 4 years and 40 lbs. That is the bare minimum however as most kids are not mature enough for a booster seat until they are much older! Which brings me to boosters, kids need to be in a booster until they are between the ages of 8-12 years, are at least 4’9’’ and weight between 80-100 lbs. These are just the basic car seat rules; we’ll cover the details more thoroughly in a follow post in this series. PreviousWhen Is A Car Seat No Longer Safe? Yeah, Landyn is much too young for a booster seat. Kids should be in a 5 point harness (car seat) till at least 4 yrs and 40 lbs (although I am aware that some manufacturers have boosters for 3 yr olds…not sure why they thing that's ok). Kids need to be able to sit properly in a booster seat (no slumping, no moving the seat belt, etc) if they are going to use one. I would stick him in a car seat with a higher weight limit. We had to do the same thing with the boys, their car seat only went to 40 lbs and so it was a booster or upgrade to a better car seat. That's why we went with the Diono's as they are 5 point harnesses till 80 lbs (aka the booster seat weight limit) and even after that they can be booster seats till 120 lbs. They are pricey though and that is a hard thing to swallow but they do last forever. There are cheaper car seats on the market with a higher weight limit though I am sure. The point is that since Landyn can't actually sit in his booster properly and he's still under 4, he probably would go flying out of it in a crash (honestly even if my boys were heavy enough…they are just now hitting 40 lbs, I wouldn't trust them in a booster…just not safe enough) I would move him back into a car seat. I think this article is fantastic. It is so important that children be buckled properly and the more education the better. Your daughter is so adorable btw! This article is so helpful. Great information! so extremely important! i see some crazy carseat set up when doing preschool drop off! some 2-5 year olds not even in their boosters, just sitting on them! Great information, there are so many conflicting ideas out there for parents, its great to read that you're encouraging us all to do the safest thing for our kids! thanks! This article provides a lot of great information! Thanks! I'm still rear-facing my 20 month old when everyone else seems to think he should be forward facing by now. The one point I have trouble with is removing jackets. We live in Canada and in the winter the temperature is often -4 F or below. For months. It just isn't right to take a child's jacket off in those temps. I realize you said to put it on backwards or use blankets, but with those temps, I don't think I could do that to them. I realize it is for saftey, but it's also not good for them to be freezing! Is the Diono Radian the same as Sunshine Kids Radian? I have heard of the latter but never of the Diono before. I was wondering what kind of car seat you used, we are just ready to upsize from an infant seat (24 lbs, 30.5" at 10 months), I was thinking of the Britax Marathon but was intersted in other suggestions. Thanks! Yes Sunshine Kids changed their name to Diono late '11. 🙂 They updated their Radians just a tad but they are the same great seats that they have always been. Thanks for linking up last week with the Tuesday Baby link up. 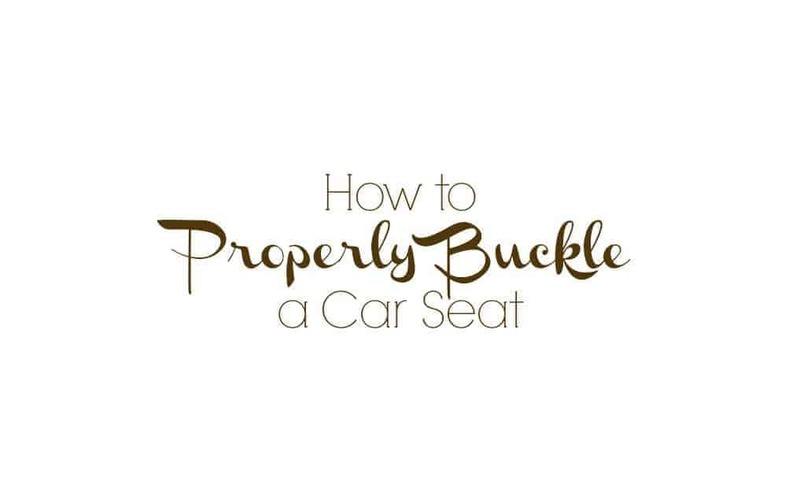 I featured your post this week since everyone knows I am a stickler for car seat safety. Thanks for sharing this great info all in one place! I will be sharing this! Wow! SO much good info. I definitely needed a refresher on this one–I'll be checking all the seats again now!! Such great information! It is so important to share this info with all moms.